This week I’d like to share the wonders of beading mats with you. Beading mats aren’t just for beadwork. I use beading mats for chainmaille, wire wrapping, and of course working with beads! These are some of the reasons I find beading mats so useful. It makes it so much easier to pick things up! 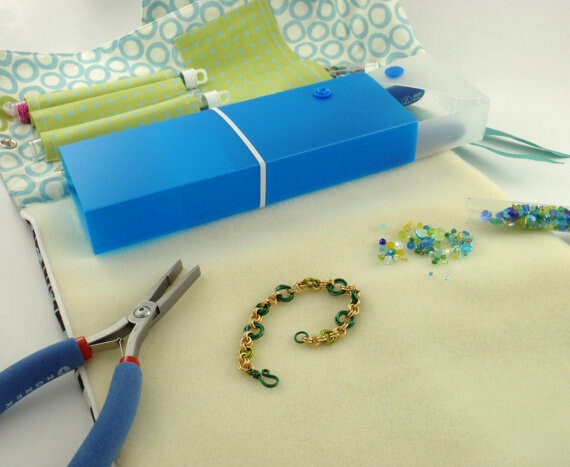 Whether it’s wire, beads, or jumprings, picking it up off of a beading mat is easier than pushing it around a table trying to get under the edge. It doesn’t matter whether you’re using your fingers or your pliers, picking it up off a bead mat saves time. Contrast makes things easier to see! When the components you’re working with match your work surface it can be hard to see the details. That might mean less quality in your joints, or that you spend more time hunting for just the right bead. Things don’t bounce! You know the sound of some small piece hitting the table and bouncing onto the floor. Replace it with the sound of a soft landing. Bead mats help keep beads from bouncing, rolling, or blowing, away from you. Organization! When your pieces aren’t rolling all over you can keep them more organized. It also helps separate your workspace from the rest of the tabletop. Clean up! Picking up small pieces is a lot easier when you can just dump them off of the bead mat and into a container. Protect your tabletop! Whether you’re protecting it from scratches, oil, or oxidation rubbing off, bead mats are there to help you out. They’ll take the beating so your tabletop doesn’t have to. Check out my favorite beading mats here!